Thank you for visiting our support page! The Assembly Call was founded before the 2011-12 season. So much has happened in the time since. Most importantly: The Hoosiers have won two Big Ten titles and made three Sweet 16s, and now Archie Miller is here to take us to the next level. And none of this would be possible without the support of our loyal, generous audience. We love hosting the show and building this website into a burgeoning online museum of Indiana basketball history. And your financial support is what empowers us do it. Here are the best ways you can support our efforts — we appreciate you even considering it. By popular demand, we began accepting donations during 2015-16 season. We use PayPal to accept online donations. We are proud to have SeatGeek as a sponsor for episodes of The Assembly Call. You can use the promo code ASSEMBLY to get a $20 rebate on your first ticket purchase. One of the biggest expenses we’ve incurred to date was the design of our logo — but it was absolutely money well spent. We love what it’s done for branding and identity, and it’s been so rewarding seeing so many people buying gear with the logo on it. The most popular item is the official Assembly Call t-shirt, sold by our friends at Hoosier Proud. 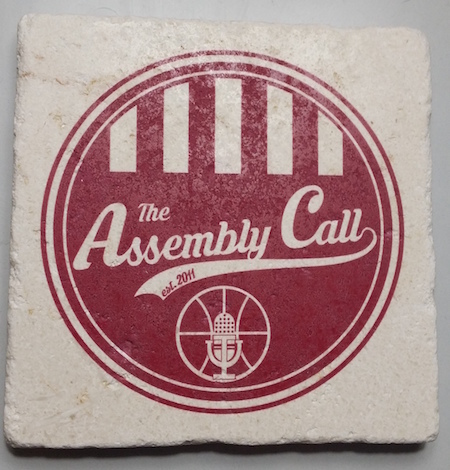 This coaster is made out of limestone and emblazoned with the official Assembly Call logo. It’s a high quality product, the print looks great, and it was the gift all Assembly Call team members received for Christmas 2015. And 25% of every sale goes directly to support the show. One way we generate revenue is through affiliate links. The way these links work is that when you click them and make a purchase, we get a commission from the merchant. Below is a list of our affiliate links. This way, you can bookmark any of them you might use in the future and then shop whenever it’s convenient for you. So now, if you bookmark any or all of these links and then remember to use them in the future (please do! ), we’ll get a commission when you buy stuff that you were going to buy anyway … which helps support the show. We appreciate it! 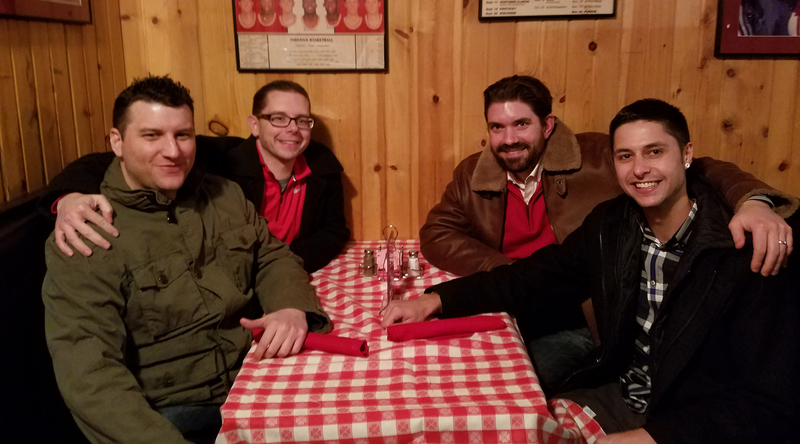 We commemorated the remarkable 2015-16 run to the Big Ten Championship by turning our postgame emails into the definitive anthology of that memorable season. 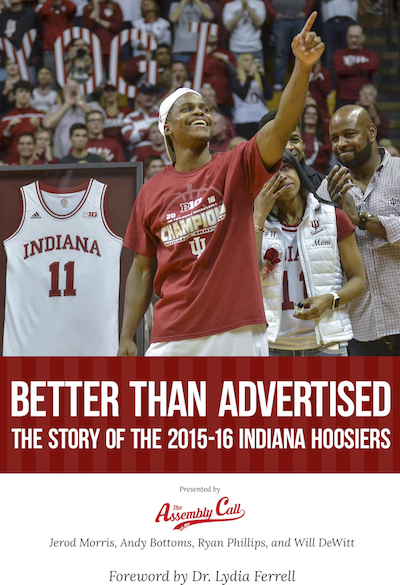 Our book — Better Than Advertised: The Story of the 2015-16 Indiana Hoosiers — is available in paperback on any website where books are sold. You can also order the ebook right here on our site.